Patient and persistent, silent and alone, Dawn is continuing its extraordinary extraterrestrial expedition. Flying through the main asteroid belt between Mars and Jupiter, the spacecraft is using its advanced ion propulsion system to travel from Vesta, the giant protoplanet it unveiled in 2011 and 2012, to Ceres, the dwarf planet it will reach in about eight months. Most of these logs since December have presented previews of the ambitious plan for entering orbit and operating at Ceres to discover the secrets this alien world has held since the dawn of the solar system. We will continue with the previews next month. But now with Dawn three quarters of the way from Vesta to Ceres, let’s check in on the progress of the mission, both on the spacecraft and in mission control at JPL. The mission is going extremely well. Thank you for asking. The spacecraft, in what is sometimes misleadingly called quiet cruise, has spent more than 97 percent of the time this year following the carefully designed ion thrust flight plan needed to reshape its solar orbit, gradually making it more and more like Ceres’ orbit around the sun. This is the key to how the ship can so elegantly enter into orbit around the massive body even with the delicate thrust, never greater than the weight of a single sheet of paper. The probe is equipped with three ion engines, although it only uses one at a time. (The locations of the engines were revealed shortly after launch when the spacecraft was too far from Earth for the information to be exploited for tawdry sensationalism.) Despite the disciplined and rigorous nature of operating a spaceship in the main asteroid belt, the team enjoys adding a lighthearted touch to their work, so they refer to the engines by the zany names #1, #2, and #3. Darth Vader and his Empire cohorts in Star Wars flew TIE — twin ion engine — Fighters in their battles against Luke Skywalker and others in the Rebel Alliance. Outfitted with three ion engines, Dawn does the TIE Fighters one better. We should acknowledge, however, that the design of the TIE Fighters did appear to provide greater agility, perhaps at the expense of fuel efficiency. Your correspondent would concur that when you are trying to destroy your enemy while dodging blasts from his laser cannons, economy of propellant consumption probably shouldn’t be your highest priority. All three engines on Dawn are healthy, and mission controllers consider many criteria in formulating the plan for which one to use. This called for switching from thruster #2 to thruster #1 on May 27. Thruster #1 had last been used to propel the ship on Jan. 4, 2010. After well over four years of inaction in space, it came to life and emitted the famous blue-green beam of high velocity xenon ions right on schedule (at 4:19:19 pm PDT, should you wish to take yourself back to that moment), gently and reliably pushing the spacecraft closer to its appointment with Ceres. 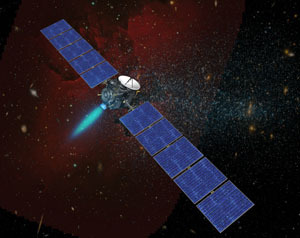 Artist’s concept illustrating the Dawn spacecraft pointing ion engine #1 in the direction needed for thrusting. Following this example, see the two images below, in which the spacecraft rotates to different orientations to ensure the other ion engines point in this same direction. The solar arrays are always aimed at the sun. 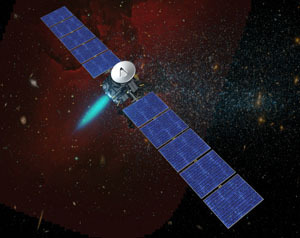 Artist’s concept illustrating the Dawn spacecraft rotated to point ion engine #2 for thrusting in the same direction as in the images above and below. 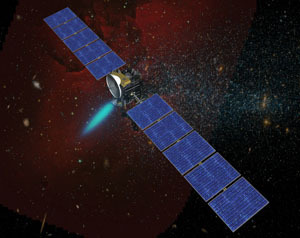 Artist’s concept illustrating the Dawn spacecraft rotated to point ion engine #3 for thrusting in the same direction as in the two images above. Without the tremendous capability of ion propulsion, a mission to orbit either Vesta or Ceres alone would have been unaffordable within NASA’s Discovery program. 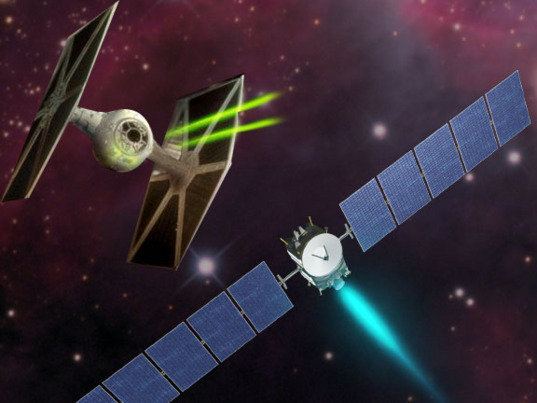 A mission to orbit both destinations would be altogether impossible. The reason ion propulsion is so much more efficient than conventional chemical propulsion is that it can turn electrical energy into thrust. Chemical propulsion systems are limited to the energy stored in the propellants. Thanks to Dawn’s huge solar arrays, electrical energy is available in abundance, even far from the brilliant sun. To make accurate predictions of the efficiency of the solar cells as Dawn continues to recede from the sun, engineers occasionally conduct a special calibration. As we described in more detail a year ago, they command the robot to rotate its panels to receive less sunlight, simulating being at greater solar distances, as the ion propulsion system is throttled to lower power levels. Following the first such calibration on June 24, 2013, we assured readers (including you) that we would repeat the calibration as Dawn continued its solar system travels. So you will be relieved to know that it was performed again on Oct. 14, Feb. 3, and May 27, and another is scheduled for Sept. 15. Having high confidence in how much power will be available for ion thrusting for the rest of the journey allows navigators to plot the best possible course. Dawn is on a real power trip! The reason for going to Ceres, besides it being an incredibly cool thing to do, is to use the suite of sophisticated sensors to learn about this mysterious dwarf planet. (In December, we will describe what is known about Ceres, just in time for it to change with Dawn’s observations.) Controllers activated and tested the cameras and all the spectrometers this summer, verifying that they remain in excellent condition and as ready to investigate the uncharted lands ahead as they were for the fascinating lands astern. The engineers also installed updated software in the primary camera in June and are ready to install it in the backup camera next month to enhance some of the devices’ functions. All of the scientific instruments are normally turned off when Dawn is not orbiting one of its targets. They will be powered on again in October for a final health check before the approach phase, during which they will provide our first exciting new views of Ceres. To achieve a successful mission at Ceres, in addition to putting the finishing touches on the incredibly intricate plans, the operations team works hard to take good care of the spacecraft, ensuring it stays healthy and on course. In the remote depths of space, the robot has to be able to function on its own most of the time, but it does so with periodic guidance and oversight by its human handlers on a faraway planet. That means they need to stay diligent, keep their skills sharp, and remain watchful for any indications of undesirable conditions. On July 22, the team received information showing that Dawn was in safe mode, a special configuration invoked by onboard software to protect the spacecraft and the mission, preventing unexpected situations from getting out of control. As engineers inspected the trickle of telemetry, they began to discover that this was a more dire situation than they had ever seen for the distant craft. Among the surprises was an open circuit in one of the pressurized cells of the nickel-hydrogen battery, a portion of the reaction control system that was so cold that its hydrazine propellant was in danger of freezing, temperatures elsewhere on the spacecraft so low that the delicate cameras were at risk of being damaged, and a sun sensor with degraded vision. To make it still more complicated, waveguide transfer switch #5, used to direct the radio signal from the transmitter inside the spacecraft to one of its antennas for beaming to Earth, was stuck and so would not move when software instructed it to. Other data showed that part of the computer memory was compromised by space radiation. As if all that were not bad enough, one of the two star trackers, devices that recognize patterns of stars just as you might recognize constellations to determine your orientation at night without a compass or other aids, was no longer functional. Further complicating the effort to get the mission back on track was an antenna at the Deep Space Network that needed to be taken out of service for emergency repairs. And the entire situation was exacerbated by Dawn already being in its lowest altitude orbit around Ceres (the subject of next month’s log), so for part of every 5.5-hour orbital revolution, it was out of contact as the world beneath it blocked the radio signal. The team conducted ORTs (and even an ORTathon) before launch in 2007, before Vesta in 2011, and as recently as May 2013. They will hold another in August. While mission controllers exercised their skills in the ORT, the real spacecraft continued streaking through the asteroid belt, its interplanetary travels bringing it 45 thousand miles (73 thousand kilometers) closer to Ceres each day. But it is not only the Dawn team members who are part of this adventure. The stalwart explorer is transporting everyone who ever gazes in wonder at the night sky, everyone who yearns to know what lies beyond the confines of our humble home, and everyone awed by the mystery, the grandeur, and the immensity of the cosmos. Fueled by their passionate longing, the journey holds the promise of exciting new knowledge and thrilling new insights as a strange world, glimpsed only from afar for more than two centuries, is soon to be unveiled. Dawn is 4.2 million miles (6.7 million kilometers) from Ceres. It is also 2.67 AU (248 million miles, or 399 million kilometers) from Earth, or 995 times as far as the moon and 2.63 times as far as the sun today. Radio signals, traveling at the universal limit of the speed of light, take 44 minutes to make the round trip. Thanks for another wonDawnfully written article! : ) In the training exercise I'd hazard an assessment and say that the best attempt to recover may be to bring the spacecraft, if any way possible existed, closer to the sun for a warm up. Then apply the new strategy as soon as it simulated success. It's a good thing this did not happen. That scenario reminds me of an APOLLO mission a friend of mine simulated in his backyard with 3 friends during an actual mission. The 4th friend, (MOCR) I guess got tire of this so he waited until they were asleep then he simulated a catastrophic failure prior to Lunar orbit. They woke up to late to the calls to save the spacecraft. Grrr... he was not happy to say the least! Game over. They were sound sleepers and did not hear the wake up calls as I understood his explanation of the failed mission. Hi Dr.Rayman! I remember that you portray yourself as Chief Engineer of the USS Enterprise in a documentary feature some years ago, talking about the Ion Engine. It was in Star Trek when something like this concept was first mentioned... back in the 1960s. Science fiction then became reality! Hi Carlos, Dr Rayman - The Star Trek episode referred to is "Spocks Brain" in season 3. Someone about my age back then watched it also and he went onto NASA eventually and helped design the ion engine. I'm sorry but I do not remember the engineers name. Nifty trivia. 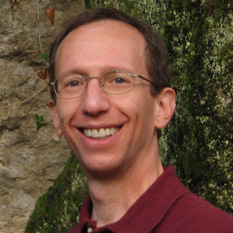 Hi Carlos and Bob, I have talked often about the connection between science fiction and science fact, because it is a fun way to draw people into the mission. Indeed, that is why I called it ion propulsion on Deep Space 1 rather than the more general but less appealing term "solar electric propulsion." But the details are often misunderstood. Science fiction gets its ideas from science fact far more than many people seem to realize. The scientific and engineering ideas behind electric propulsion predate Star Trek by decades. Robert Goddard wrote in his notebook about a version of it, and Konstantin Tsiolkovsky published a technical paper a few years after that. Ernst Stuhlinger, a colleague of Wernher von Braun, made important technical contributions in the 1950s, and he followed DS1 and Dawn with interest. Many others contributed along the way as well, but it wasn't until DS1 that an operational interplanetary mission actually used it, paving the way for Dawn. Hi Bob, In my overly hasty effort to squeeze my previous comment into the character limit, I omitted a key piece of information. Goddard wrote about electric propulsion in his notebook in 1906, more than half a century before the Star Trek episode. While you and I may first have heard about ion propulsion in Star Trek, it certainly didn't originate there. By the way, I noted the death of 94-year-old Ernst Stuhlinger, as well as his work on ion propulsion, in my May 27, 2008 Dawn Journal (http://www.planetary.org/blogs/guest-blogs/marc-rayman/1476.html). I share your wistful feelings about the grand visions from the "good old days." On the other hand, I would proffer that even better than visions is real accomplishments. While we may not have as much as we want (we are greedy, aren't we? ), given the realities of current constraints (and recognizing the unique circumstances in which those visions were formulated), the exploration of space is still very productive and very exciting. Hi Dr. Rayman -- I'm in agreement with you about space being productive and very exciting! I am greedy and wish we could do all the missions people want to do. The reality as we know is we can't. What we are doing now is very exiting. Thinking back when I was first introduced to space exploration (via my favorite kid TV show, Pappy Parker's Corral, with Wally Schirra's Mercury flight) I dreamed about all kinds things that we now have done. I never thought I see you guys and ladies, getting to the outer solar system as fast as you all did. I figured my grand kids may be the first to see Uranus, Neptune, Pluto and beyond up close and personal. WOW! I'm glad to be wrong on that point! Thanks to you and your team for Dawn and the great excitement she returns! Oh yes, I love the learned science also! : ) THANK YOU ALL! Dr. Rayman -- I went to the link you posted from yesteryear that you referenced for Ernest Stuhlinger. Robert 'Bob' - Hmm? where have I heard that name before? Goddard - S.E.P. - 1906. I wonder why my grandfather (en engineer - designed aircraft carriers and a myriad of things after WWII for GE - never told me about that. Al he said is "never let anyone tell you there is a speed limit, including light speed!" You just have to figure out how to pass it. He was born in 1892. Graduated Penn State in 19?? after WW1 in France. For those following this thread I found this youtube video to be entertaining. http://www.youtube.com/watch?v=IjR36EAR_B4 My only suggestion for Dr. Rayman (and all his coworkers) is to avoid wearing red shirts at work. Thank you for the thoughtful tip, Jonathan! Thank you Jonathan! I like that video. Did you ever see the GOOGLE logo cartoon last year with the red shirted 'e' crying throughout the cartoon? That was hilarious if you are a Star Trek fan! Otherwise you would not have understood it. Thanks again for the great link! I appreciate your concern for Dawn, Saxton. You and I have similar bad dreams, although usually it's waveguide transfer switch #4 in my dreams, not #5.